DISCLAIMER: This is a work of fanfiction for my personal entertainment (and maybe yours). Dragon Age: Origins and all related characters and locations are the property of Bioware Inc. RATING: Grown ups. Two days after that, Alistair was crowned King of Ferelden and named Allaré, his betrothed, Commander of the Kings Army as well as Commander of the Grey Wardens. The Grey Wardens that Loghain had turned away were found before they returned to Orlais. A quarter of the group remained to aid Allaré with rebuilding the Wardens and dealing with the remaining Darkspawn hordes that continued to harass the surface. Allaré and Alistair’s companions expressed desires to travel, but Allaré convinced them to stay at least long enough to see them wed. Until the wedding, the companions occupied their time with an investigation into the Deep Roads, led by Leliana at Alistair’s request. Alistair left much of the rebuilding of Ferelden to Arl Eamon, preferring battle to politics, yet, over the next few months, Allaré would often find their bed strewn with books, Alistair lost among them, intent on learning how to be a good King. In time, it was Alistair who would preside over trade negotiations with King Bhelen of the dwarves and granted the elves land and rights. It was a sore point for many, but Alistair stood firm in his decision and dealt justly and decisively with all issues that arose from these and many other agreements. Six months later, Alistair and Allaré were married in a joyous, but modest celebration. She was walked down the aisle by her brother, Fergus, who had rebuilt the Cousland estate with reparations from the Howes. No longer bound by Allaré’s wishes, Sten departed for his homeland and Wynne left with Shale. Zevran reneged on his original plans to return to Antiva, having fallen utterly in love with the fiesty Shianna. Oghren married Felsi and they joined the Legion of the Dead. 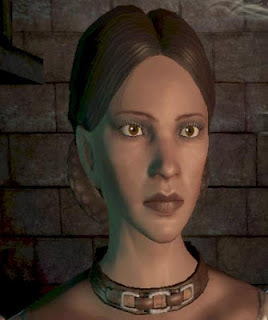 Leliana remained at court, earning the title of the Royal Bard. She composed many popular songs and poems about their adventures, and, despite her fame, served as a very capable and inconspicuous spy. She was very much loved by both the King and the Queen and often shared their bed. Beautiful strawberry blond twins, Duncan and Eleanor, were born three years into Alistair and Allaré’s reign and their three parents raised them with love, temperance and wisdom. Despite Avernus’ later discoveries, Alistair and Allaré agreed that they would not risk having a child together. One child born of dark rituals was enough, though they never pursued Morrigan.